You try to eat right by planning your meals and shopping the perimeter of the store. You get enough sleep and exercise regularly. But what if some of your healthy habits, actually aren’t? Read below as we dig a little deeper into some common healthy habits that aren’t necessarily what you thought they were. You drink water…too much and at the wrong time! Some people struggle to get enough water in during the day. Others drink too much. We should aim for about 8-10 cups of water per day. If you have a favourite cup or reusable water bottle that you like to use, take note of how much liquid it holds and adjust accordingly. Also, drinking too much liquid with meals makes it more difficult for your body to break down food efficiently as it dilutes naturally occurring digestive enzymes. This can contribute to the belly bloat after dinner. You don’t eat fruit because you are worried about the sugar. Fruit, when eaten as a part of a balanced snack or meal is a great addition to your diet. True, fruit contains naturally occurring sugar in the form of fructose. Fruit, also contains fibre and a host of valuable vitamins, minerals and phytonutrients. If blood sugar regulation is a concern, opt for lower glycemic fruits such as berries and tart apples and minimize your consumption of tropical fruits such as bananas, pineapple and mangoes. For a little added protein, pair your fruit with a small handful of raw nuts or seeds. This one simple addition to your snack will help you stay full longer. You eat low fat…all the time. Our bodies do however, require healthy fats to absorb important fat soluble vitamins such as A, D, E & K found in food such as greens. Forget the low fat salad dressing friends! Try making your own tasty salad dressing with 1/2 c olive oil, 1 clove garlic, minced, 1/2 lemon, squeezed, 1 tbsp Italian seasoning, 1/4 tsp sea salt. Place all ingredients into a jar with a lid and give a shake. Enjoy! Healthy fat supports hormone function, eye health and even brain function. Sources of healthy fats include salmon, raw nuts, coconut and olive oil, hemp hearts, chia seeds as well as ground flax seed. Low fat processed foods are often higher in sugar than their regular versions. When we compare ingredient lists and nutrition facts we notice the various emulsifiers and starches listed on the low fat package. The fat may be reduced but the sugar or carbohydrate value actually increases. Protein powder and bars make a regular appearance in your diet. Protein has been a big buzz word in the world of nutrition lately. Adequate protein is essential for muscle maintenance and development, tissue healing and can even lead to weight loss as it curbs hunger. However, processed protein in the form of powders and bars can give you a false sense of health. Many of these items are artificially sweetened or flavoured and essentially are nothing more than milk shakes and candy bars. Clean, whole food based protein supplements are fine to use on a rotating basis, but they should not replace whole food options. Whole food sources of protein include meat, cheese, eggs, lentils, beans with rice, chia seeds and raw nuts or nut butter. This can be a bit of a hot topic. While I do agree that consuming organic food is the optimum choice, there are few other matters to consider. Purchasing local foods from a trusted farmer is my favourite way to shop. Eating food grown in season and allowed to naturally ripen in our own ‘backyard,’ is preferable to purchasing that bag of organic apples grown on another continent. Get to know your local farmers and ask them how they grow their crops. 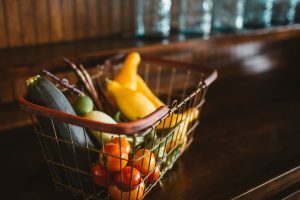 A great resource for knowing what to try and purchase organic is found on the Environmental Working Group’s website and is called the Dirty Dozen & Clean Fifteen.